Join CHAW for Friday ARTnights. CHAW will host Drop-In Figure Drawing facilitated by artist Will Fleishell and Clay and Cabernet with teaching artist Clay Hollenkamp. For details, click here. 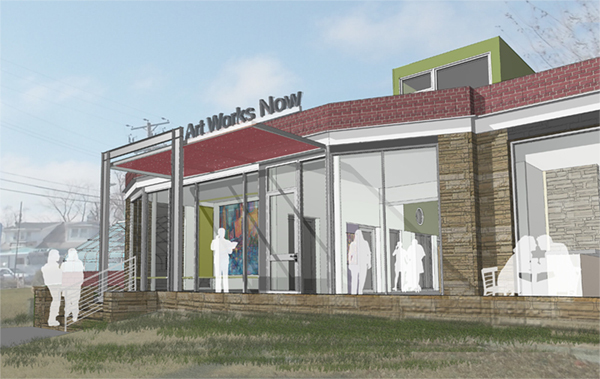 Art Works Now – 10 a.m. to 12 p.m.
Join Art Works Now for the groundbreaking ceremony of their new home. Together with Pizzeria Paradiso, Art Works Now will breathe new life into a long neglected corner in the Gateway Arts District. Following the groundbreaking with state and county officials in attendance, the public is encouraged to participate in art activities. For details and to RSVP, click here. The event is located at 4800 Rhode Island Ave., Hyattsville, MD. Joan Hisaoka Healing Arts Gallery – 3:30 p.m. The Joan Hisaoka Healing Arts Gallery invites guests to meet the curator and artists of Sanctuary. Visitors will be able to attend a casual reception following the artists’ talk and have the opportunity to mingle with the artists. For more information, click here. The Joan Hisaoka Healing Arts Gallery is located at 1632 U St. NW. Otis Street Arts Project – 5 p.m. to 7p.m. CONVERGENCE is an exhibition featuring wood sculpture and mixed media furniture by Andrew Christenberry. For more information, click here.